The exact country of origin for the breed is not clear, but the country from which the most recent foundation stock came is Ireland. Some research indicates that common ancestors include the Poodle, Barbet and Portuguese Water Dog. Recent history has the breed taking its present form in the 1830's. Its development is credited to Justin McCarthy and his "Boatswain" dog. The breed's purpose is that of a waterfowl hunter; his strong swimming ability enables him to be physically qualified for the task. He is a quality retriever in any cover and is used for a variety of game. The breed has retained type for over 150 years, and is very popular in Ireland. The Irish Water Spaniel has been recognized by the United Kennel Club since 1948. The breed is the tallest of all spaniels. It is a solid liver color, with dense curly hair. Two identifying characteristics of the breed are its "topknot" and "rat tail." Easily trained, the Irish Water Spaniel makes a good family dog, protector of the home, and obedience dog. The breed shows initiative and courage. Its overall appearance is appealing. The breed's characteristic water-resistant, curly coat needs to be groomed, but not clipped like a Poodle's. His appearance may lend to his reputation as a clown. The head is of good size and cleanly chiseled. It should not present a short, wedge-shaped or cheeky appearance. The face hair is short and smooth, but has a beard that grows in a narrow line at the back of the jaw. Is rather large and high in the dome, with a prominent occiput and a gradual stop. The topknot is a characteristic of the breed. It consists of long, loose curls growing down into a defined peak between the eyes. It should not appear wig-like; that is, growing straight across. Long, strong and somewhat square, with a deep mouth opening and lips that are fine in texture. Large, with open nostrils. Liver colored. Medium in size, and almond in shape, dark amber or dark hazel in color. Expression is keenly alert, intelligent, direct and quizzical. Very long and lobe shaped in the leather. Set low, hanging close to the head and covered abundantly with curls. The neck is long, arching, muscular and set strongly into the shoulders. The throat is smooth. The shoulders are powerful, sloping and clean. The chest is deep, extending to the elbows. The forelegs should be well-boned, straight and muscular. The body is of good size and medium length, giving the breed a slightly rectangular appearance. The back is short, strong and level. The well-sprung ribs are carried well back. They are pear-shaped to the brisket, and rounder toward the hindquarters. The loins are wide and muscular. The body gives a barrel-shaped appearance and should not look tucked-up. The hindquarters are as high, or slightly higher than, the shoulders. They are powerful, with long, well-bent stifles and muscular thighs. The hocks are set low. The hips are wide. Well-developed hindquarters are of utmost importance since they are vital to swimming. Large, thick and somewhat round and spreading. Well covered with hair. The tail is set on low, giving a rounded appearance to the hindquarters. The tail has two or three inches of curly hair at a thick base, and tapers to a fine point at the end. 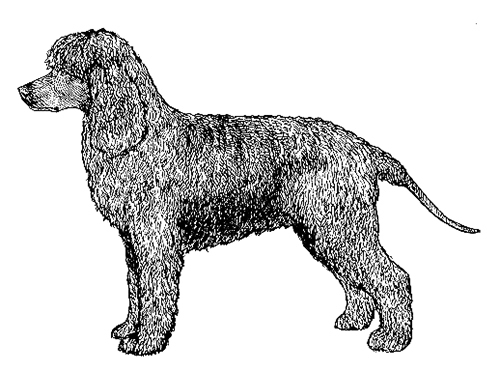 The hair (other than the curly hair at the base) should be short, giving the appearance of being clipped and looking like a rat's tail, which is a characteristic of the breed. The tail should not be long enough to reach the hock joint. Serious Fault: White on the chest. The neck, back and sides should be densely covered with tight, crisp ringlets. The hair should have natural oiliness. The forelegs are well-covered with hair in curls or waves down to the feet. Below the hocks on the hind legs, should be smooth in front, but feathered behind down to the feet. Proper coat is of vital importance. Smooth, free and ground-covering, with a characteristic rolling motion produced by the barrel shaped body. Males: 22 to 24 inches at the shoulders; and 55 to 65 pounds. Females: 21 to 23 inches at the shoulders; and 45 to 58 pounds.